Imagine you are the director of development at a hospital foundation in a mid-sized city. You have an average intake of 100 patients every day. You know from building lists in your prospect research tool that there are many wealthy individuals giving to healthcare causes in your area. But are they visiting your hospital? If they are, do you know how to establish positive relationships with them to encourage charitable contributions? What is a grateful patient program? Hospitals and healthcare facilities are often a setting for transformative life events. If a person had a positive experience while being a patient or the family member of a patient, they may wish to extend their gratitude to the hospital and its staff. Sometimes, this could be the beginning of a lifelong donor relationship. A grateful patient program is a process of identifying potential donors from a list of patients and moving them through the major gifts funnel. At regular intervals, be it daily or monthly, the development team will then collect these individuals. The names are then screened for philanthropic and wealth indicators using a screening service like iWave. The screen identifies patients who have a propensity or inclination for giving to charity, an affinity or linkage to healthcare — especially to your hospital or organization — and the capacity or ability to provide donations. This strategy is called patient screening and is a powerful component of a proactive, predictive grateful patient program. Once any major gift prospects have been identified, the development team can cultivate those prospects. This program could involve any number of fundraising strategies and tactics; personal visits from board members or fundraisers, newsletters delivering updates from the hospital, or invitations to special events. Remember though – the development team must act quickly! Three months is the accepted best practice for gift solicitation. After three months, patients are less likely to become donors. Here is how you can implement a grateful patient program at your healthcare organization. Consult with your team and decide what you want the program to achieve. 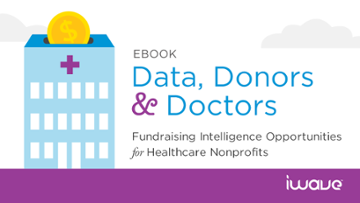 Do you simply want to identify potential donors within your patient lists to increase donations? Or do you also want to improve the quality of care, your patient’s experience, and the staff’s morale? Remember that major donors see their contributions as investments. Much of your fundraising efforts will involve connecting donor interests with tangible goals your hospital strives for. Will the development team require special resources, training, or policies to implement a unified, ethical, and effective strategy? What role will other leadership, staff, and volunteers play? 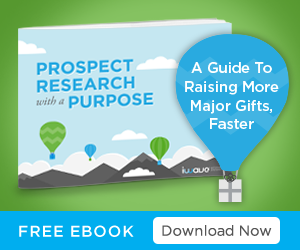 Use this as an opportunity to plan your solicitation strategy and tactics.When you identify a major gift prospect within a patient list, how and when will you approach them? Maybe a board member could visit, or you could extend an invitation to your next fundraising event. You can be as creative as you like, but remember that patient care always comes first. If nothing else, you may learn valuable information about how to improve your hospital’s services. Assign responsibilities for collecting and preparing patient data. Ensure your organization complies with various national and state legislation concerning donor privacy, such as HIPAA and PIPEDA. For more information concerning donor privacy and ethical sourcing, watch iWave’s webinar with prospect researcher, Lori Lawson. Many healthcare organizations already use iWave Screening to fuel their grateful patient program. First, a team member customizes project settings depending on current fundraising goals and processes. The goals and processes for a large hospital can be very different from a local health clinic. 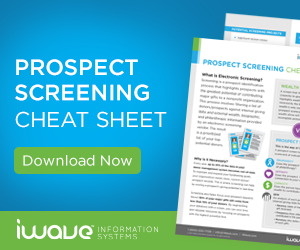 iWave Screening is valuable no matter how big or small your fundraising program may be. 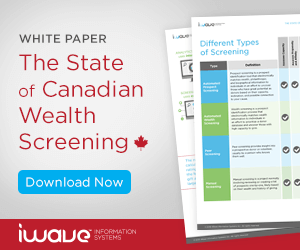 After determining goals and project settings, the next step is to download the screening template and populate it with patient data from your database. Remember to include as much information from your donor database in the screening file as possible, including any available internal giving data. Next, upload the list to iWave. Within hours or even minutes, you receive results with an iWave Score for each prospect. Now it’s time to really kick your grateful patient program into gear. 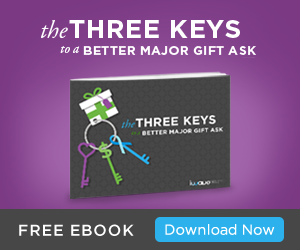 You may find that a longtime mid-level donor is actually above your organization’s threshold for major gift prospects. This insight is most powerful when considered alongside the external iWave Score. Each prospect’s iWave Score is an average of three ratings (propensity, affinity, capacity) based on iWave’s billions of external data records. When you cross-reference both internal (your database) and external (PRO database) views, you will identify the best prospects and be able to act on those opportunities faster and with increased confidence. iWave Screening examines your list both internally (with an RFM scoring system) and externally (iWave Sore) at the same time. Once you have your results, you’re done, right? Not so fast — we’re just getting started! Looking at your screening results, you sort and prioritize according to fields included in your input template. Maybe you want to sort the list by the primary caregiver, or you want to see if any patients are known VIPs. Once you have segmented the list, you can create profiles for each prospect at the click of a button. Within these profiles, you can view all the records that generated that prospect’s unique RFM and iWave Score. You also have the ability to add and delete records where required. We recommend this as a best practice. Even the best screening solution will include false positives, but not every screening solution allows you to easily remove them and then refresh scores. Make sure you find a tool that does! 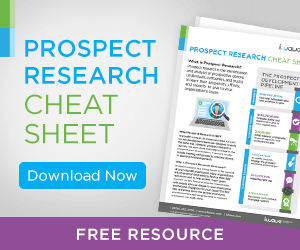 As research and fundraising professionals, you understand your own prospects and donors more than any software tool can. Always make time to verify the records for accuracy and relevance to your prospect. If you make any changes to the profile, you can easily refresh the scores to reflect these updates. Once you have validated screening results and generated donor profiles, pass them on to fundraisers or gift officers. Ensure follow-up occurs within three months of the patient’s last visit. When the fundraiser gets a win, build a good-news story around it. Steward new donors by inviting them to volunteer with the organization and join the culture of philanthropy. Your grateful patient just became a one-time donor. Now it’s time to develop a lifelong donor relationship with them. As with implementing any new program, there will be stumbling blocks along the way. As you begin the program, have regular meetings with various stakeholders. Ask them what is working and what isn’t. Also, ask the patients themselves! Make collecting feedback a regular part of the program. When you have your recommendations, be ready to adapt the program accordingly. About the author: Ryan McCarvill joined iWave in 2016. Ryan enjoys meeting and learning from nonprofit professionals, researching trends in the nonprofit community, and offering strategies for development teams to use iWave’s solutions to meet and exceed their fundraising goals. Want to see iWave in Action? Try the platform for free today!